Oakland Zoo is proud to announce 20 years of taking action for elephants with our annual Celebrating Elephants events on May 21 and 28, 2016. Oakland Zoo is proud to announce 20 years of taking action for elephants with our annual Celebrating Elephants events on May 21 and 28, 2016. Both events are designed to increase awareness about elephants while offering guests rare and fun experiences around elephants that take place only at these events. The two events serve as fundraisers for elephant conservation and have raised over $250,000 for elephants in the wild since 1996. May 21 at 6:00pm marks the first event, an Evening Gala that will feature keynote speaker and world-renowned elephant researcher and conservationist Dr. Cynthia Moss, founder of the Amboseli Trust for Elephants in Kenya. Dr. Moss will talk of Amboseli National Park in Southern Kenya where she and her team have led the longest-running elephant field research project in the world; the park also serves as home to more than 1,700 African elephants. These 1,700+ elephants have been studiously observed, catalogued, and protected by the Amboseli Elephant Research Project (AERP) since Dr. Moss founded the project in 1972. Over the last 30 years, the AERP team has identified and named every elephant in the park, following and recording each individual's social behavior, reproductive history, feeding habits, and communication with the herd. Due the presence and efforts of Dr. Moss and her team, the Amboseli elephant population has been increasing slowly since the late 1970s. The Evening Gala will also include a reception and silent auction of many unique items from Bay Area restaurants, sports venues, shops and artists, including paintings by Oakland Zoo’s own African elephants and behind-the-scenes experiences with zookeepers. The Celebrating Elephants Evening Gala begins at 6:00pm in the Zoo’s Zimmer Auditorium with the reception and silent auction, followed by Dr. Moss’s presentation at 6:30pm. The cost for this event is a sliding scale of $40 - $100 per person and tickets can be purchased at the door or online. May 28 marks the second Celebrating Elephants event, the Day Event, which takes place at the Zoo during regular business hours. 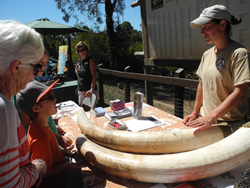 The Day Event features once-a-year elephant barn tours where guests can get up- close and personal with one of the Zoo’s four African elephants and learn about the Zoo’s fascinating elephant program from one of their Lead Zookeepers. Elephant barn tours ($10 per adult and $5 per child) are not included with Zoo admission and may be purchased in advance online or in person on the day of the event at either Flamingo Plaza or the elephant exhibit. Other Day Event activities include a mock research camp designed to offer guests the opportunity to don binoculars and become a field researcher for the day. Fascinating facts about these enormous animals will also be shared at Elephant Education Stations throughout the Zoo, such as touching gigantic pachyderm bones, holding an eleven-pound tooth, and stepping into an elephant-sized footprint. Circus Finelli, an animal free circus, will perform in the Clorox Wildlife Theater at 12:00pm and 2:00pm. The acts feature comedy, acrobatics, juggling, dance, and live music. Both the Evening Gala and Day Event are designed for all to become inspired by elephants while raising funds to ensure their survival in the wild. All proceeds from both Celebrating Elephants will be donated to the Amboseli Trust for Elephants, which helps ensure the long-term conservation and welfare of Africa’s elephants through scientific research, training, community outreach, public awareness and advocacy.